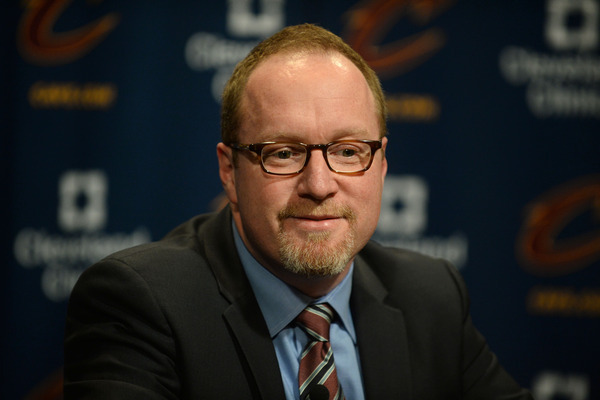 Cleveland Cavaliers general manager David Griffin continues to operate without a contract extension, which is weird. The Cavaliers won a title last season, and he’s responsible for many of the savviest post-LeBron James moves this franchise has made, despite its glaring lack of flexibility. The Orlando Magic recently asked for permission to talk to Cleveland general manager David Griffin about their president of basketball operations opening, but Cavaliers owner Dan Gilbert has been unresponsive to the request, league sources told The Vertical. Griffin’s contract expires at the end of June, and the Cavaliers could choose to hold onto Griffin past the end of the team’s playoff run and the NBA draft on June 22, and forbid him to engage Orlando until the cusp of July 1 free agency. For Gilbert, it could be a stall tactic in hopes of making Orlando grow tired of waiting on Griffin and eventually offering its job elsewhere; or Gilbert could be planning to relent and let Griffin discuss the Orlando job with officials at the end of the Cavaliers’ playoff run. So far, Cleveland hasn’t made a substantive offer to Griffin, league sources told The Vertical. That the Cavaliers haven’t made a “substantive offer” to Griffin is ludicrous. Perhaps they don’t want to muddy the midseason waters with contract talks, but they’ve had ample opportunity to lock him up, and most definitely should have done so after winning last year’s title. Gilbert’s non-responsiveness could be interpreted as a sign that he plans to retain Griffin, or maybe that the two sides have already struck an under-the-table deal. Still, until a new contract is signed, Cavs fans have reason to be uneasy. Griffin has proved time and again he can maximize whatever assets—or non-assets, really—the team gets its hands on. To bid him farewell now, when they arguably need him most given their financial outlook, would be absolutely absurd, a failure at the highest level of a franchise that is supposed to have things figured out.